The error or the superficiality of many editions of Pinocchio lies mainly in the fact that the illustrations give primary attention for graphic designs, but without a clear interlocking with the text. In our edition, by contrast, the drawings have been made expressly in Tuscany, where the author imagined his masterpiece [my translation from the Madrid edition]. I have now scanned 93 images from my copy of that edition of Carlo Collodi’s fairy tale that can be seen: here. Artificial Intelligence is clearly a fairy tale inspired, in part, in Pinocchio and set in the future. I would suggest fans of Alice Miller to read the original story in an edition whose drawings respect Carlo Collodi’s tale. 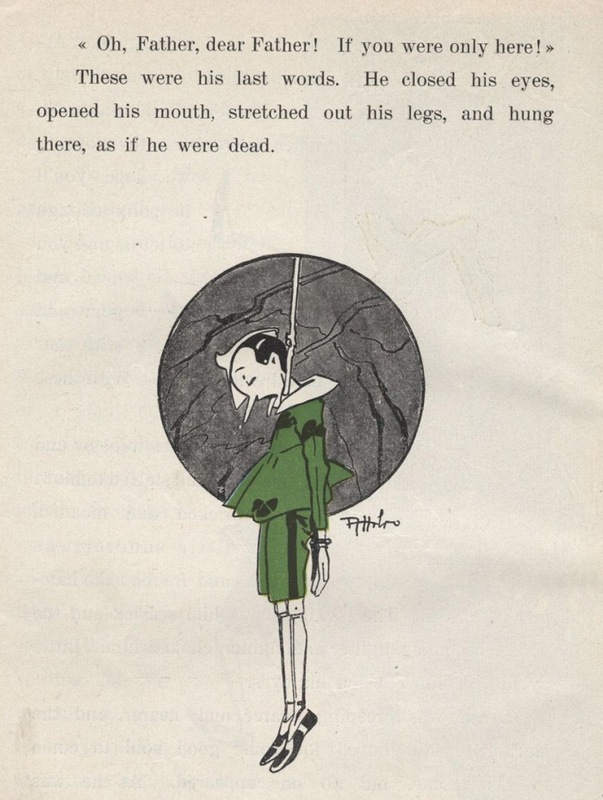 The error or the superficiality of many editions of Pinocchio lies mainly in the fact that the illustrations give primary attention for graphic designs, but without a clear interlocking with the text. In our edition, by contrast, the drawings have been made expressly in Tuscany, where the author imagined his masterpiece. 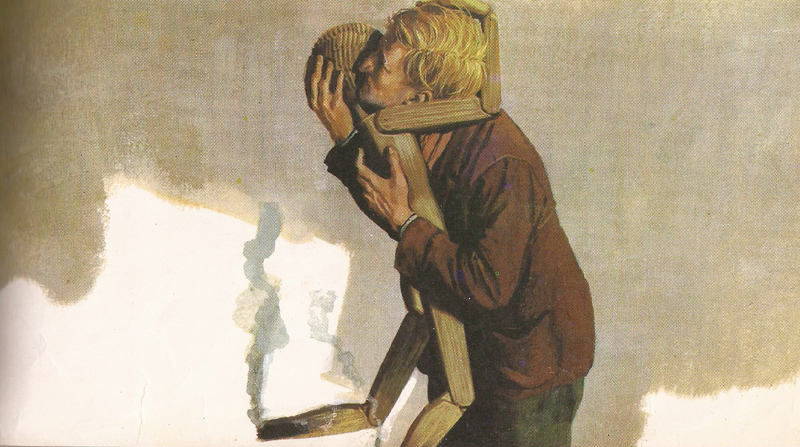 Pinocchio has not yet appeared and the story reveals the personality of its maker. Like many other distortions, the image of Geppetto in the Disney film as a kind old man grossly distorts Collodi’s tale. He may tear him to pieces! The neighbors knew that this was how an acquaintance of them behaved. Although in that passage Collodi puts Geppetto as the victim, and Pinocchio as a miscreant who despised a loving father, the neighbors knew better. In real life, of course, runaway children do so because of horrific abuse at home. As I have had dealings with these children in Mexico City I have the impression that behind every street child, even those who I haven’t interviewed, there is a horror story at home. It is very instructive that Collodi inverts reality in a story meant to subjugate the will of the child before the omnipotent adult. That is precisely the reason that his story became a bestseller in a world dominated by parents who want to “educate” their children through poisonous pedagogy. I have been asked why the recent focus of The West’s Darkest Hour on Nietzsche. I replied that my intention is to explain (1) the “transvaluation of all values” (Nietzsche’s ultimate philosophy) and (2) “poisonous pedagogy” which goes together with the “trauma model of mental disorders” (illustrated in Nietzsche’s life). As to #2, I believe that one of the ingredients of the witches’ brew that is killing whites is the toll of child abuse in the adult. In the white nationalist movement no one has suspected this. A few months ago Alex Kurtagic wrote on The Occidental Observer that the engulfing behavior of Jewish mothers towards their male children explained the haughty behavior of the grown-up Jew. But Kurtagic and the rest of writers of the pro-white blogosphere have failed to ask what could the engulfing behavior of white mothers cause on their white children. I am the only one in the movement who has written on the implications of the trauma model on white pathology. See for example my seminal article, “A body-snatched Spaniard.” I even plan to translate to English the rest of my book Hojas susurrantes, the most didactic and comprehensive explanation of the model under a single cover. However, since that kind of literature is very strong meat indeed, and since pro-white advocates are uninterested in the subject, I better start introducing it by means of baby steps, like my next series of entries on Carlo Collodi’s novel for children. The original Pinocchio tale by Collodi is must reading. A 1880 magazine series (Disney’s 1940 film is a betrayal of the original Italian tale), Collodi projected his feelings for his abusive parents onto the characters of the very manipulative Blue Fairy and Geppetto. The editor asked Collodi to rescue Pinocchio in the following issue of the magazine. As a child Collodi had been tormented in a Jesuit school (incidentally, as a child my father was also tormented in a Jesuit school). Since Collodi (like my father) never settled accounts with the perpetrators, he later identified himself with them; hated the children, illustrated boring school textbooks for them and always lived with his manipulative “Blue Fairy” mother. The original Le Avventure di Pinocchio is poisonous pedagogy at its worst. The parents and the school system are idealized at the expense of the child’s true self. (Later in my series on Nietzsche you will see the relevance of the Prussian pedagogy applied to the child Nietzsche by his mother and other female figures and his adult breakdown.) A major bestseller, Collodi’s novel was used to manipulate and socialize children in the early 20th century. In future entries I will show that together with the German biographers of Nietzsche I will be quoting, Alice Miller is the obliged reference to understand “poisonous pedagogy” and ultimately my interpretation of both Pinocchio and many people who have suffered mental breakdowns.